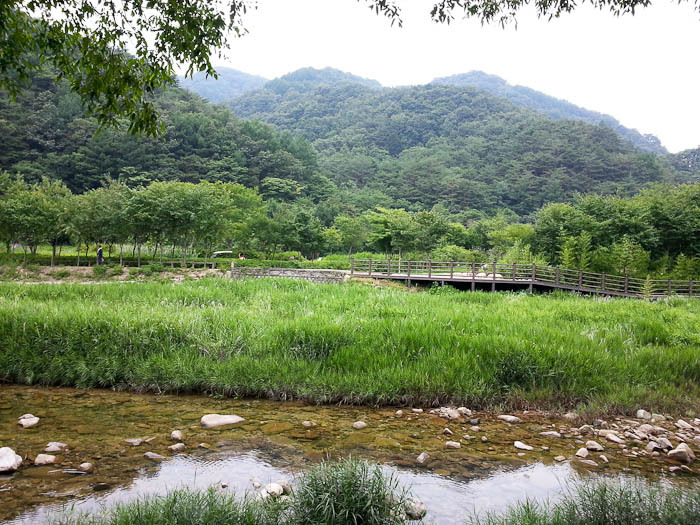 I knew living and working in Korea for one year was not going to be easy, but there are times when I still automatically reach for the easiest, most comfortable route. When I was asked to go on an overnight trip with the staff at my school, I will admit I immediately tried to find a way out of it. Staff dinners on a school night are one thing, but 2 days and one night with 26 Koreans who don’t speak English sounded a bit uncomfortable. I was wrong though. Despite the awkwardness, I did have fun and am happy I experienced the Korean version of team building. The trip started off at 1:00 on Friday afternoon. We boarded a bus at school with our overnight bags, all the Koreans whooping in excitement. I, on the other hand, was busy looking around and noticing how the bus looked an awful lot like a noraebang. Turns out that’s exactly what it was–a noraebang on wheels. As soon as we left the school parking lot, the disco lights came on the serenading began. Wait, really?! I though I’d at least be tipsy for this! Each time the song book and remote was handed to me, I quickly passed it on hoping no one would call me out to sing a song. Seriously, I needed soju if they were going to make me sing. No such luck though, they demanded I sing and after taking too long to look at the song book they decided I should sing a Beatles song (among the English songs this generations of Koreans know, I assume). So, Hey Jude it was. It was terrible, but I think they were very entertained. They didn’t ask me to sing again though. I was given an itinerary for the trip right before we left, however it was all in Korean so I really had no idea what we doing or where we were going (information is rarely passed down to me, I’m really learning to just go with the flow). I just knew there would be lots of hiking, eating and drinking involved. 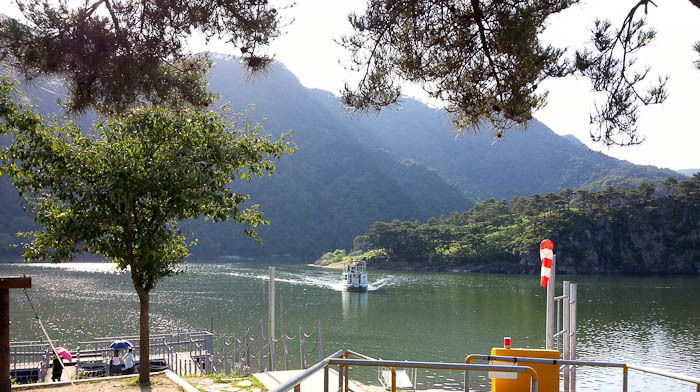 After an hour on the noraebang bus, we arrived at Goesan Lake which was absolutely beautiful. It was a very hot, humid afternoon and after being handed a frozen bottle of water, I followed the group for a “hike” around the lake. About halfway around the lake we stopped for makgeoli (a slightly carbonated alcoholic drink made from rice and wheat) and pajeon (a savory pancake with vegetables). Makgeoli and pajeon are typical snacks along hiking trails at any hour of the day, and both are quite tasty. 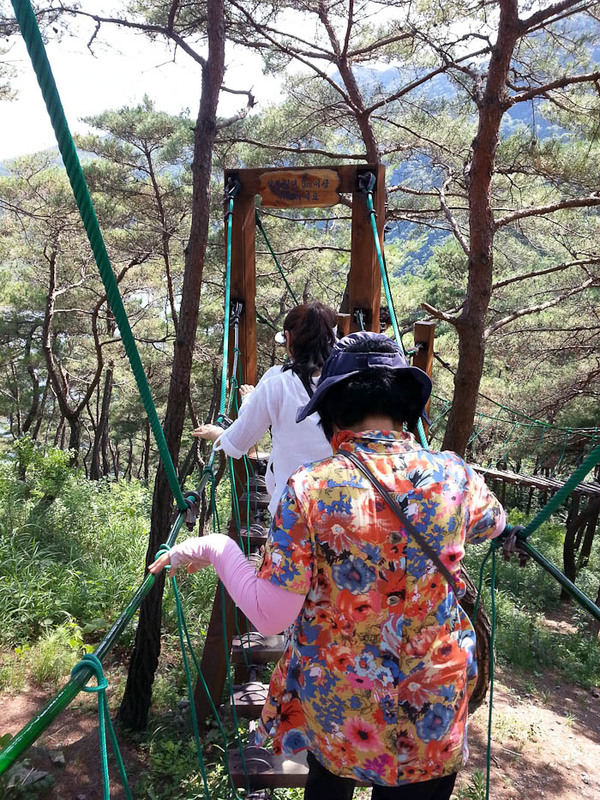 Crossing strange suspension bridges at Goesan Lake. After downing makgeoli out of traditional style bowls and walking away with a pretty good buzz (apparently makgeoli is gulped, not sipped) we hopped on a boat the took us across the lake and back to where we started. Then we boarded the mobile noraebang for more singing and arrived at our housing for the night 20 minutes later in Mungyeong. 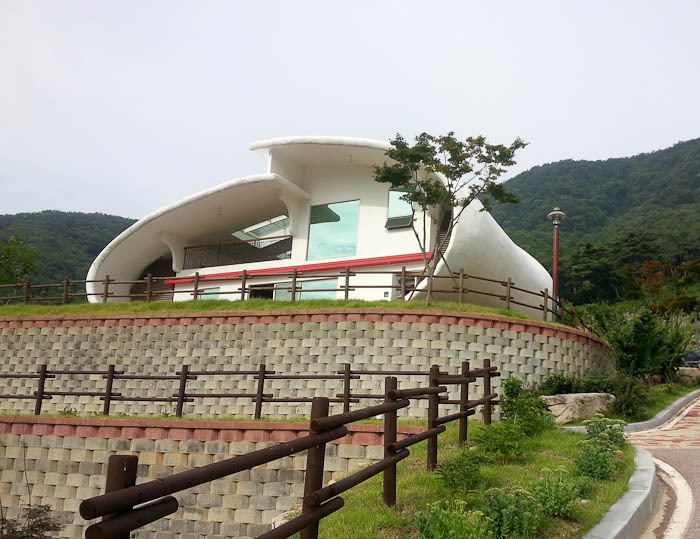 The bus was unable to make it up the steep hill to the houses, so we walked up to the unique-looking vacation homes–one for all the females, one for all the males–that had a beautiful view of Saejae Valley. 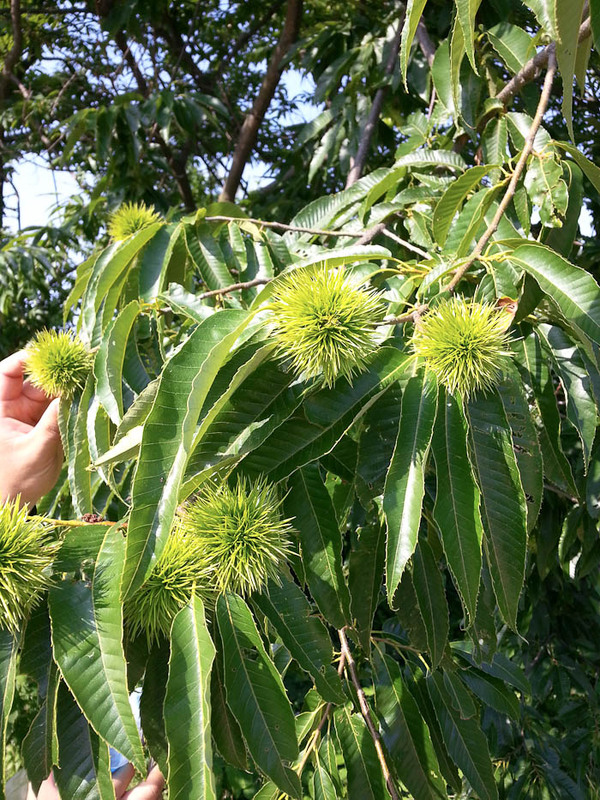 Chestnut trees surrounded the lake making chestnut flavored makgeoli popular in this area. The boat that picked us up to take us to the other side of the lake. 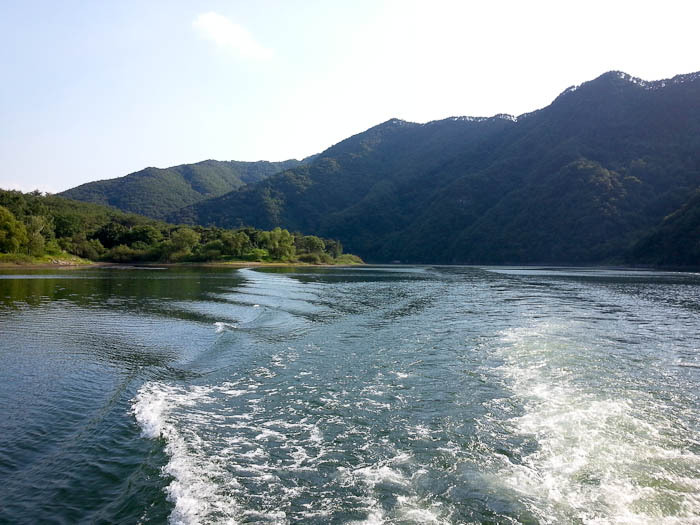 View from the boat on Goesan Lake. We quickly toured the house and chose sleeping spots. As I admired the view, wondering what was up next on the itinerary, I turned around to see all the women sitting in a circle on the floor doing yoga-like stretches. They waved me over to join them, which I did, and followed their stretches, continuing to wonder what all their conversations were about (my co-teacher speaks a decent amount of English, but she wasn’t joining us until later). It was suddenly announced that it was time for dinner, or at least that’s what I assumed, and we once again boarded the bus. 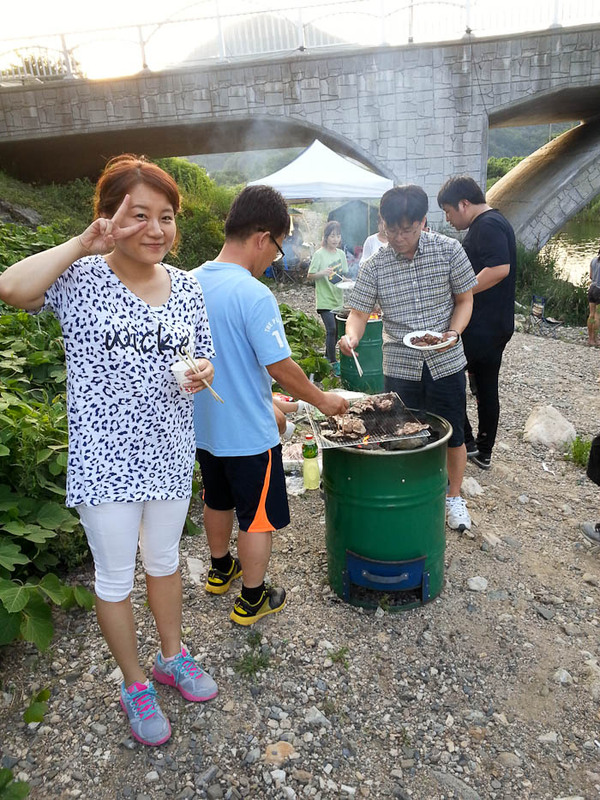 I thought we were going to a restaurant, but instead we pulled up to a spot by a river where BBQing had already been started by a few teachers who drove all the supplies there. Tons of pork and sausages (aka hotdogs) were passed around along with rice, kimchi, garlic, onions and some sort of salad with zucchini and onions covered in spicy dressing. 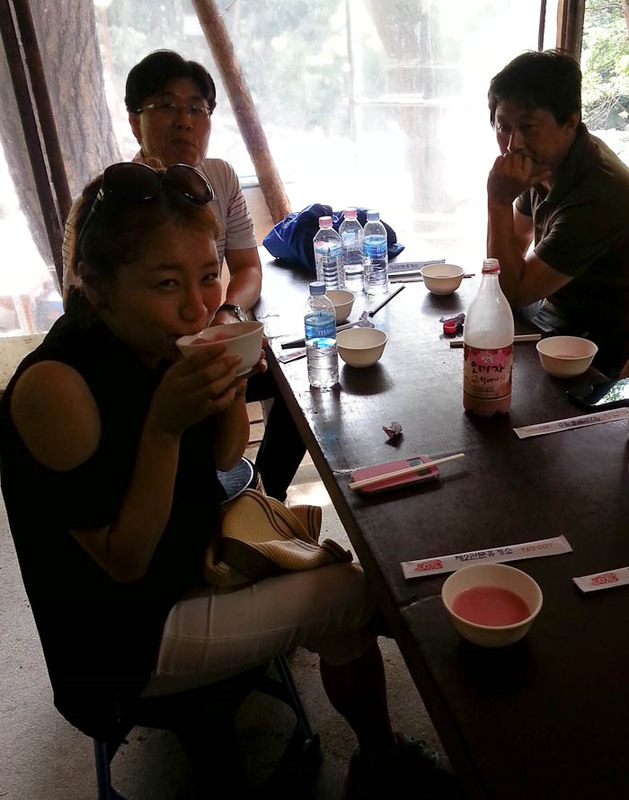 This was of course chased down with soju (a distilled, vodka-like rice liquor) and beer. I was thinking how full I was when suddenly more food appeared on the grill and I was encouraged to keep eating. Grilled eel and more pork, followed by grilled mussels, clams and corn on the cob. I was so full, but I pushed through. It’s very hard to say no to Koreans when they offer you something. Our interesting looking vacation house. 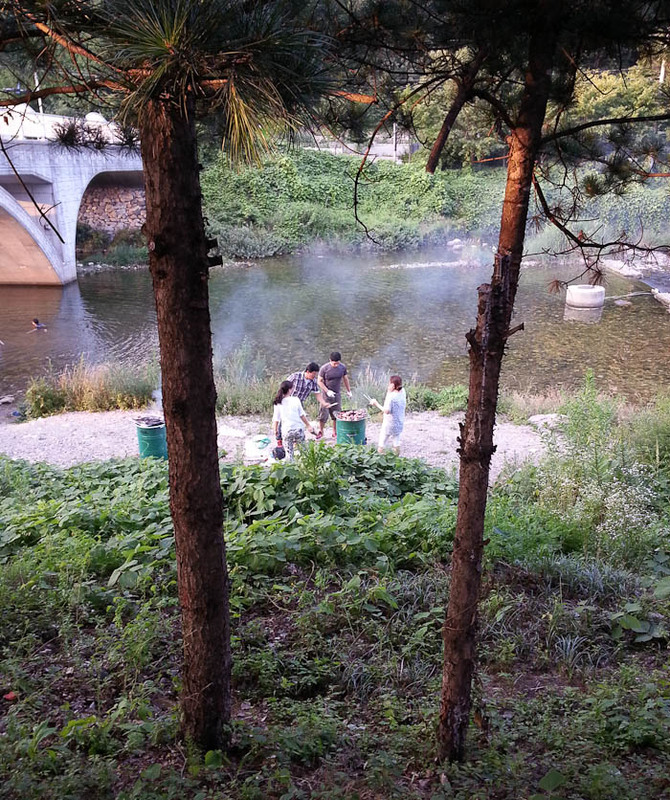 Dinner being prepared by the river. My co-teacher who goes by Chloe. My co-teacher finally showed up, and I was a bit relieved to have someone to communicate with (even though she’s not much of a translator). After enjoying dinner beneath a nearly full moon by the river, we headed back to the house. At this point it was close to 9:00 and I wondered what was next. More drinking, I assumed, as three tables were set up in the middle of the living room. 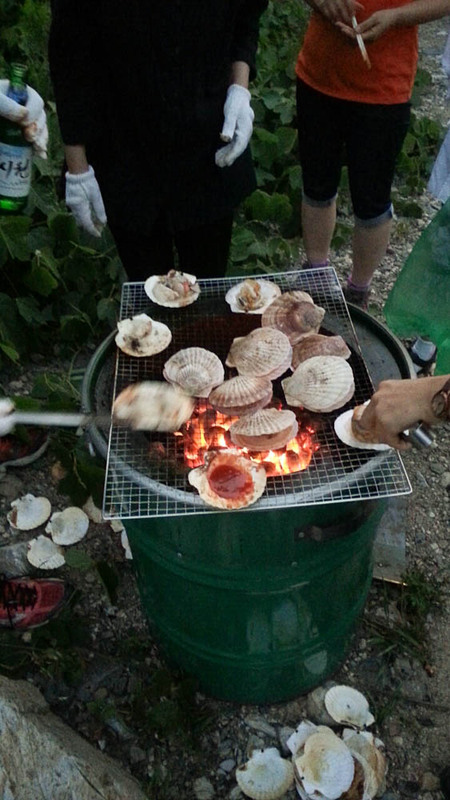 Soju bottles and beer cans were placed on the tables, followed by plates of watermelon, bowls of chips and nuts, huge plates of cold noodle salad and platters of pork, along with the most disgusting smelling raw fish that is apparently eaten on special occasions. So I guess this was going to be dinner number 2? I was already stuffed from dinner number 1, and the pajeon and makgeoli. They were very insistent that I keep eating, though, and I guess that’s a good thing with the amount of alcohol being consumed. 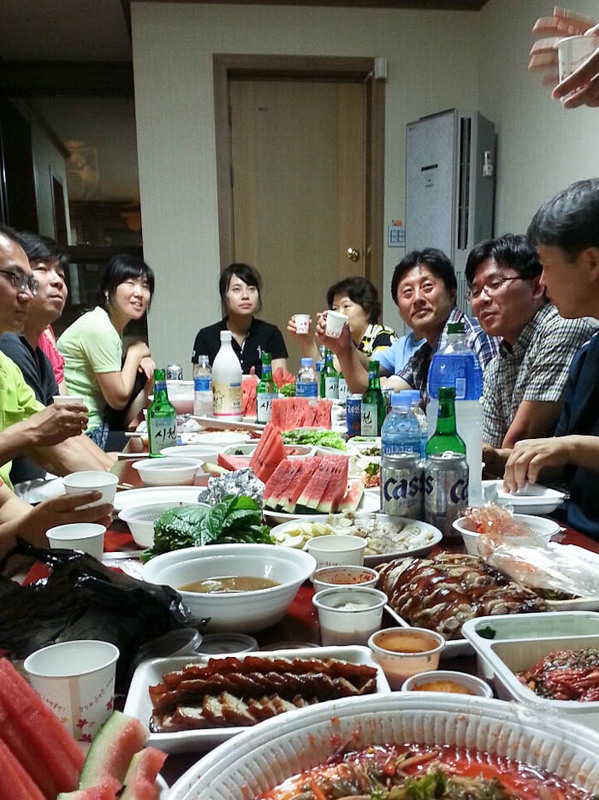 The next 3 hours consisted of chit chat around the table, endless speeches, soju shots and cheers…all in Korean. Suddenly I heard my name and everyone was looking at me. I guess it was time for me to give a speech. At least I had soju in me now. I stood up and babbled on about how appreciative I was for the experience, and thanked them for welcoming me…something along those lines. They had no idea what I was saying so I suppose it didn’t really matter what I said. I raised my glass and said cheers, expecting my speech to be over, but they all just kept staring at me. I looked back at them, giggly and confused, wondering what they wanted me to do. I looked at my co-teacher, searching for an answer so I could sit down, and she finally said they wanted me to cheers to something, I think…so I yelled “Champions!” and everyone cheered and clinked glasses. No idea why I said champions or why that made them cheer, especially when I’m not sure they even knew what that word meant, but it worked. 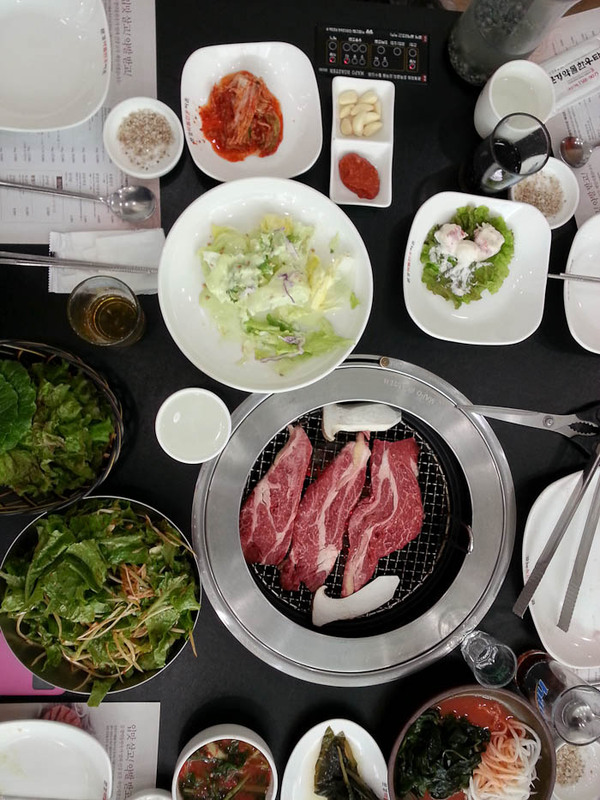 Dinner, round 2, accompanied by many shots of soju and speeches that I didn’t understand a word of. 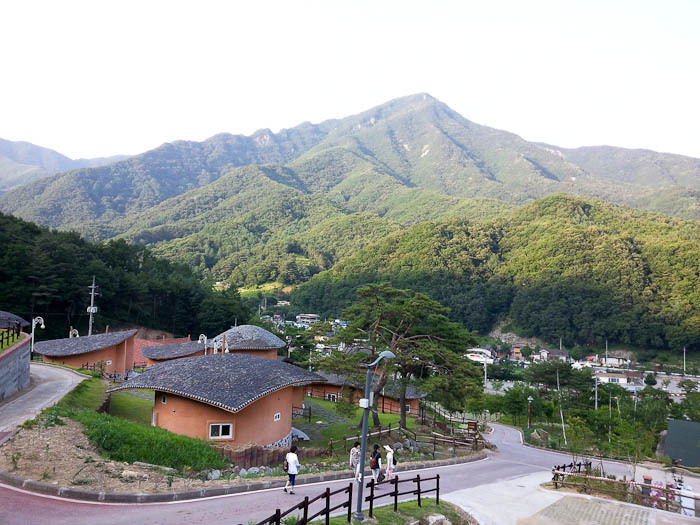 The drinking and eating finally wound down around 1 am and I was happy to escape to my blanket and pillow on the floor to get some sleep (most Koreans sleep on the floor, not on comfy Western style beds), as I was told we’d be climbing a mountain at 7 am the next morning. I woke up with a slight headache and a stiff body from an unrestful night of sleep and was immediately offered breakfast, which consisted of ramen (ramyeon), kimchi, corn on the cob and watermelon. I took a piece of watermelon and a bottle of water and called it good. I do like kimchi, but still can’t bring myself to eat it for breakfast, especially that particular morning. As I sat sipping on terrible instant coffee that is so popular in Korea, I wondered if I’d misunderstood the part about climbing a mountain. All the women around me were diligently doing their hair and makeup while wearing quite fashionable outfits. I came prepared for hiking and was not looking my best. My c0-teacher even asked me where my earrings were. I told her I didn’t wear any because I thought we were going hiking. She then confirmed that we were. Hmm, I guess I am just not a fashionable hiker. After cleaning up the rest of last night’s mess, we finally headed out for the mountain I thought we were about to climb. 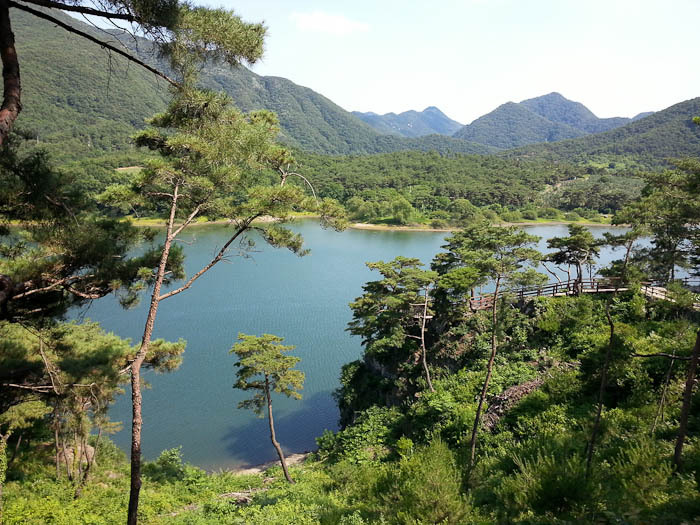 Turns out it was more like a long walk in Mungyeong Saejae Provincial Park. It was really beautiful and I was slightly relieved to not be climbing a mountain at that moment in time. 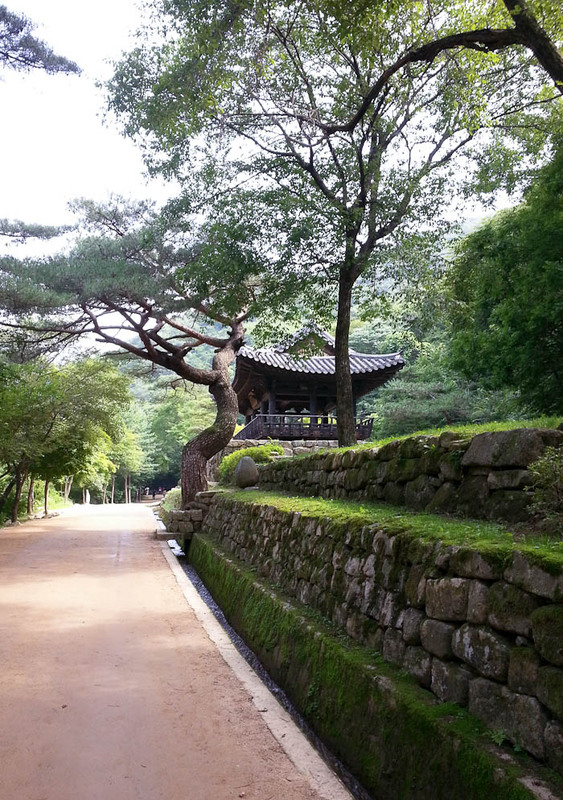 All signs were in Korean so I’m not sure about the history of the park, but it was a lovely walk. 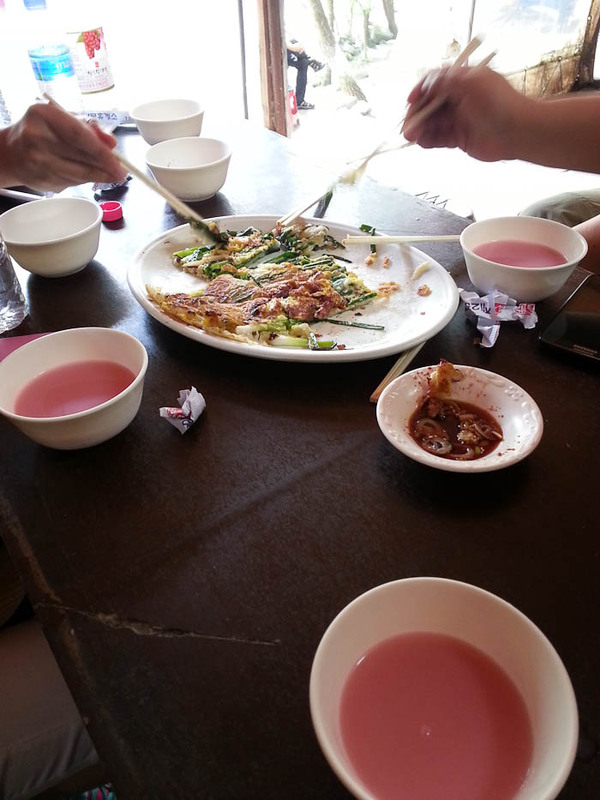 We stopped for a break after a few hours and enjoyed some more makgeoli and pajeon (yes, more alcohol at 10 am). 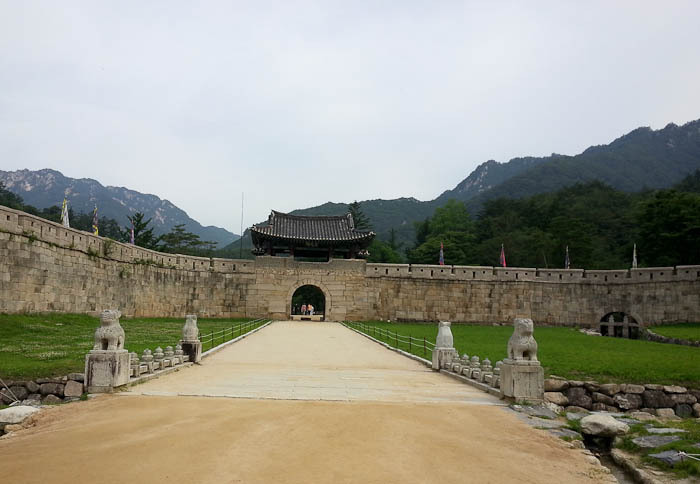 Then we headed back to the entrance to get on another bus which would take us to have lunch (thankfully it wasn’t a noraebang bus this time). We drank more beer and enjoyed grilled yakdol pork for lunch (Mungyeong specializes in this brand of pork, which comes from pigs that are fed germanium and selenium, supposedly making it healthier and tastier) and then went a ceramic museum that happened to be next door to the restaurant. 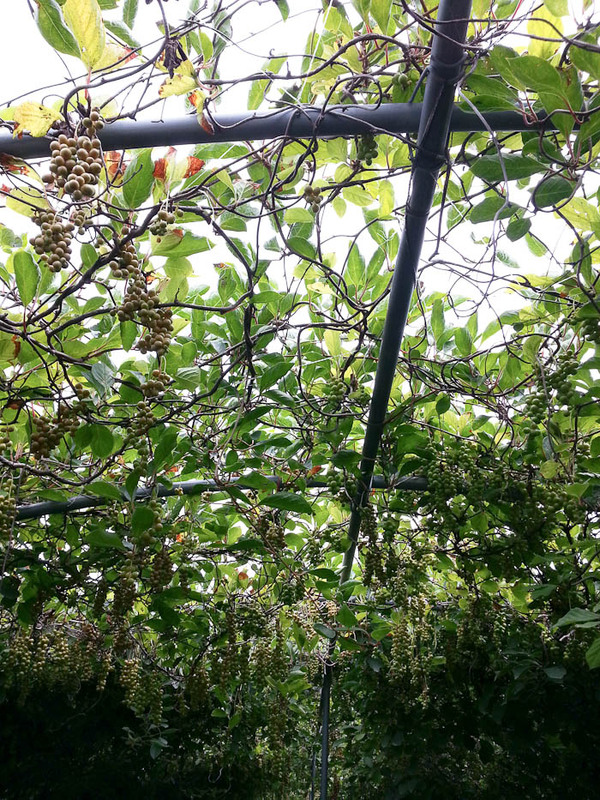 To wrap up the afternoon, we toured an omija berry farm that is famous for it’s omija sparkling wine. The omija berry (red in color and translates to five tastes) apparently has many great health benefits including boosting the immune system and lowering blood pressure. My co-teacher drinking omija flavored makgeoli. Pajeon and omija flavored makgeoli (regular makgeoli is milky white in color). We ate yakdol pork for lunch which was grilled at our table. Omija berries, which turn red when they’re ripe. The bus ride back to our school was pretty quiet. I think everyone was exhausted from all the eating a drinking. I certainly was, but not just from that. Trying to communicate with a huge language barrier can be very tiresome. Walking into my quiet apartment, I felt a wave of relief for having survived my first overnight trip with the staff at my school. I was hesitant to go mainly because I had no idea what to expect and it meant feeling quite awkward at times, but I am very happy I went and am grateful for the experience. Champion!